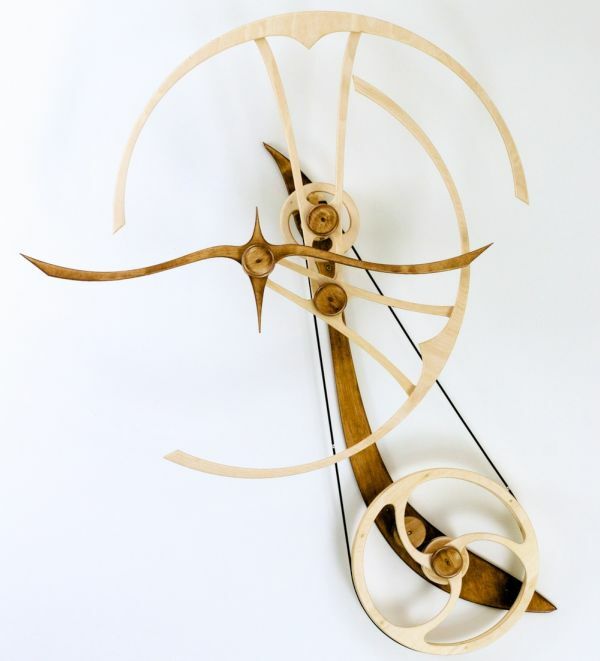 Combining wood work with physics, Connecticut-based artist David C. Roy has been creating various dynamic wall-mounted wood sculptures from past thirty years. 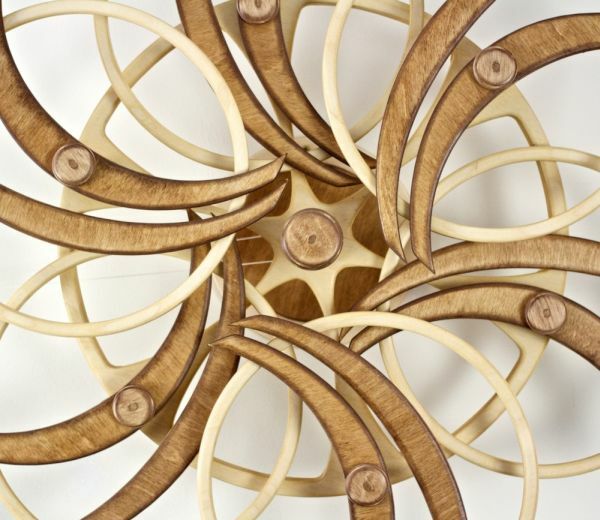 The limited edition wall installations may appear like inner working of a mechanical clock, but these are basically spring-driven kinetic wood sculptures that are capable of spinning from five to 15 hours constantly. However, his latest work dubbed ‘Dimensions’ is designed to spin constantly up to 40 hours on a single wind. The most amazing thing about these dynamic sculptures is that these run without any electric current. Some of the previous sculptures were integrated with suspended weight to induce motion, just like in a pendulum. On the other hand, Roy’s all-new wood art relies on a constant force spring that exerts a constant force on its range of motion. Nevertheless, regular wound is needed to keep these whirling wall art in accurate moving condition. After graduating from Boston University in 1974 with a degree in physics, Roy learned wood work to explore his interest in creating art. His interest in motion and mechanics is clearly visible in his mind-blowing wood art, which blends science and art in a beautiful fashion. 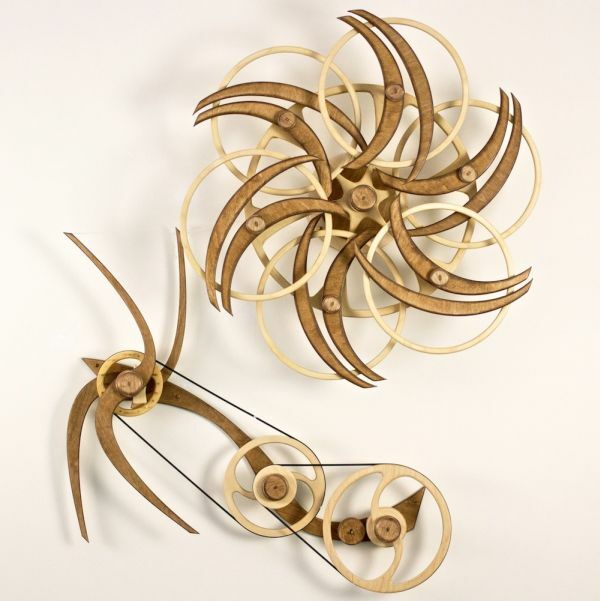 So far, Roy has created over 150 moving wood sculptures that are powered by mechanical wind-up mechanisms. The creative designs by the artist include Dimensions, Aztec, Nauutilus, Solo, etc. You can purchase Dimensions for $2,500, and other wall installations for same or high price (depending on pattern and effort put on each piece). To see more of his dynamic wall decor you may visit his official website or YouTube channel. 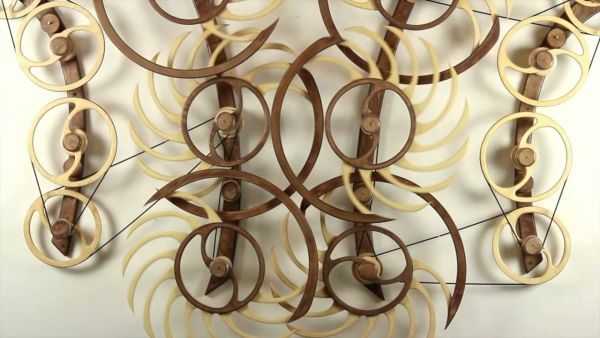 As for now, you may check out the video given below to see Dimensions wood sculpture in action.